World Alzheimer’s Month is an international campaign that happens every September to raise awareness and challenge the stigma that surrounds dementia. Dementia is a term used to describe different brain disorders, like Alzheimer’s, that affect memory, thinking, behavior and emotion. It is estimated that there are more than 46 million people worldwide living with dementia. The number of people affected is set to rise to more than 131 million by 2050. Early symptoms of dementia can include memory loss, difficulty performing familiar tasks, problems with language and changes in personality. There is currently no cure for dementia, but a range of support is available for people with dementia, as well as their families and caregivers. Dementia knows no social, economic or ethnic boundaries. Alzheimer’s disease is the most common cause of dementia. Other causes include vascular disease, dementia with Lewy bodies and frontotemporal dementia. Dementia mainly affects older people; however, it is not a normal part of aging. A new case of dementia is diagnosed every 3 seconds. Caregivers of people with dementia experience a high level of stress: physical, emotional and economic pressures. FirstLight’s person-first dementia care services at home help not only the person living with the disease, but the family as well by. Our unique programs focus on the care and wellbeing of the entire family and help address the anxiety, depression, confusion, and isolation that is often associated with the disease. We provide specialized and individualized care by compassionate professionals who have completed our rigorous training program to become Certified Dementia Caregivers. We tailor home care to your loved one’s needs and personality, not the disease. We help the person living with dementia maintain purpose in their lives while giving you and your family the opportunity to enjoy quality time with them, creating new memories. 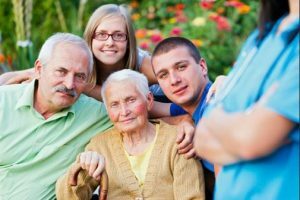 Our services allow your loved one to live at home in a comfortable, familiar environment. We assist with activities of daily living, such as light housekeeping, meal preparation, and laundry. FirstLight recently announced a partnership with Constant Therapy, a cognitive, speech and language therapy mobile app that allows users to conveniently access 80+ evidence-based brain tasks from a tablet or smartphone while at home or in a healthcare facility. Those living with cognitive deficits can practice memory, attention or language exercises on their digital devices. Patients who use Constant Therapy work on tasks connected to slow the cognitive decline associated with aging to help them remain in the place they call home for as long as possible. We are proud to be the first national non-medical home care company to use the Constant Therapy program to enrich the lives of older adults. If you would like to learn more about our partnership with Constant Therapy and the dementia care services we provide, click to find a FirstLight Home Care location near you. Join us on Facebook this month as we discuss and share information about dementia, World Alzheimer’s Month, tips and best practices for families and caregivers living with dementia. And for more information like this delivered right to your inbox, subscribe to our weekly Home Care News.